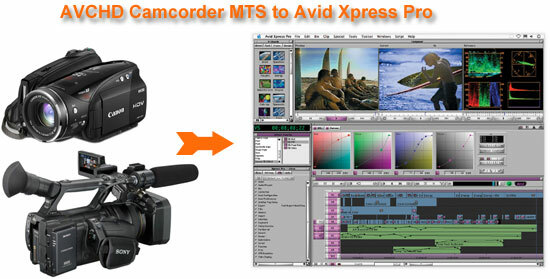 Home » Useful Guide » How to Convert AVCHD MTS/M2TS to QuickTime for Avid Express Pro? The DNxHD codec was developed and released by Avid Techonology, Inc. for high-definition video post-production. Until now, various video editing platforms like Avid Media Composer, Final Cut Pro, Kdenlive can import file with DNxHD codec, but there are some till problems. I was asked by my friend with a problem: He wanted to use Video Pier to convert AVCHD .mts files from Sony HXR-NX5V camera to Avid QuickTime DNxHD for editing on Avid Express Pro V4.6. However, the images on the video do not display on his PowerPC Mac 10.4 after importing to Avid Express Pro. He also indicated that he used Video Pier to convert AVCHD from cannon Vixia, and there is no problem. It seems that Video Pier is not stable with AVCHD camcorder videos. Even though QuickTime Pro could export video in DNxHD codec, you shall upgrade from QuickTime free version to QuickTime Pro, and QuickTime does not support AVCHD MTS/M2TS import. I got the final solution for my friend, and the Mac AVCHD converter helps him convert AVCHD .mts to QuickTime MOV with H.264 codec. Even though it is not DNxHD, the video quality is great on Avid Xpress Pro. If you have similar problem, just follow the steps below, and you can convert AVCHD .mts/.m2ts videos for videos editing tools. Step 1. Load AVCHD videos to Aunsoft MTS/M2TS Converter for Mac. After transferring AVCHD videos to Mac hard drive from camcorders like Sony HXR-NX5U, Canon VIXIA HV30, run Aunsoft MTS/M2TS Converter for Mac as Mac AVCHD converter and click the Add button to load .mts videos. Click the Format option and choose Adobe Premiere/Sony Vegas > MOV (AVC)(*.mp4) as output format. I choose the Adobe Premiere group here and Adobe Premiere is also a video editing tool. Step 3. Convert AVCHD MTS to QuickTime MOV. Click the convert button under the preview window, and the Mac AVCHD converter starts converting AVCHD camera .mts files to QuickTime .mov. Wait for a while, and the output .mov videos could be imported to Avid Xpress Pro. Aunsoft MTS/M2TS Converter for Mac helps you convert AVCHD MTS to QuickTime MOV for Avid Xpress Pro, Final Cut Pro, and Adobe Premiere. The Mac application will deinterlace the 1080i videos and remove interlace artifacts, so as to output .mov without quality loss. You can also bring AVCHD M2TS videos for conversion.